One of the chief benefits of serving as staff, consultant, and—oftener than not—conspirator for a number of events in southeast Michigan is that I love the work. I seriously love muscling the logistics of an event into place, bending contracts to my will, theorizing about methodological improvements, and seeing the final product blossom in front of me in the form of hundreds of happy attendees. I love it in a way that I never thought I would be able to back when I was doing it for a living with sleazy, money-and-accolade grabbing executives. Doing it as a hobby, generally speaking, insulates me from those sort of slick marketing type of folk; the sort I dealt with almost exclusively back before I dropped out of the corporate drama factory. Note well that I said ‘generally speaking’ because it becomes somewhat important as the following story unfolds. Let me tell you the story of a beloved Michigan event and the ‘charity’ that is trying to run roughshod over it. Before I begin, let me go back to the beginning and share some of the history—if for no other reason than context. A decade ago, a LAN party was started in the basement of a member of a Team Fortress clan known as the Ministry of Pain (]MP[) and over the course of the next ten years, the event increased in size until MPCon was forced to move onto the campus of the University of Michigan - Dearborn to accomodate the 150+ gamers requiring seats. The size has steadily increased until, having outgrown the available space in Dearborn, in 2007 the 300 person lan was moved to the student center of Eastern Michigan University. Also in 2007, video game controversy was brewing at Saline High School, where student Zach Wigal attempted to host a Halo 2 Tournament at his school. After being given permission initially, the tournament was cancelled by school officials—the mature rating and ‘first-person shooter’ style of the game was deemed inappropriate for a high school. Not one to have his ambition so easily thwarted, Zach recognized the losing battle inherent in fighting for a video game, and cleverly formulated a new plan. He would create a charitable face for his console party, and under the auspices of raising money for charity, he would far more easily find venues and love from the press. 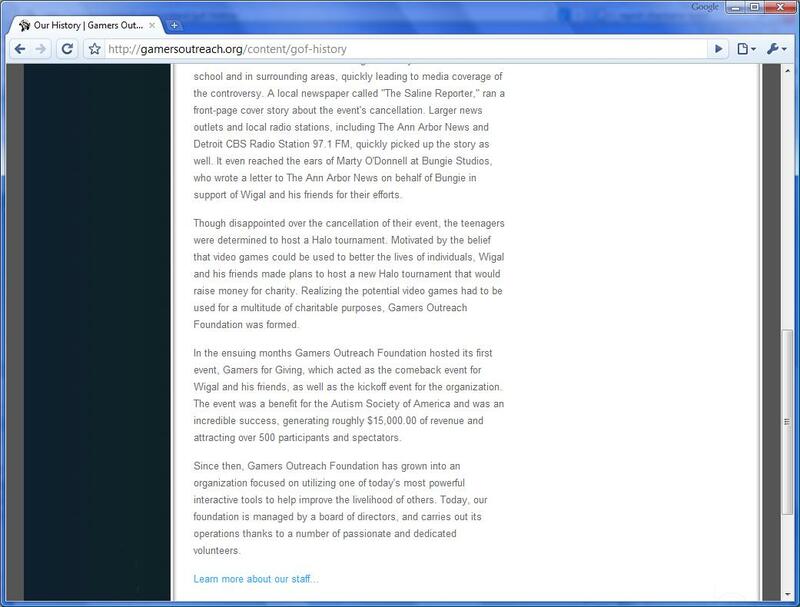 The Gamers Outreach Foundation was thus born. Recognizing how much time and energy would be required to build his own infrastructure and visibility in the gaming community, Zach saw the benefit in teaming with an older, more established organization and approached MPCon to form an alliance. MPCon, having done such a partnership in the past with Penguicon and excited about the prospect of raising money for charity opted to joined forces, and in 2008 the first Gamers for Giving took place, ostensibly to benefit the Washtenaw County chapter of the National Autism society. Fortunately, even if nobody is able to see the most recent numbers, last year's IRS990 has been made available, so some of the numbers can be evaluated, even if they can only be done so in aggregate. It shows gross receipts of nearly $28,000 and costs equal to a whopping $21,000. With MPCon supplying the entire infrastructure (switches, cabling, power lines, etc), and with GoF having obtained no tangible assets to speak of, the event planner in me finds it hard to fathom how I would go about spending $21,000, were I running the event. I just cannot find a place for the money, not rationally at least. To put this amount in context, I work with an annual event that spends somewhere in the neighborhood of $30,000 for its entire event. This number includes free food, beverages, and beer all weekend long as well as lectures, guests, flights, hotel rooms, advertising, and all other expenses; all for over 1000 people. 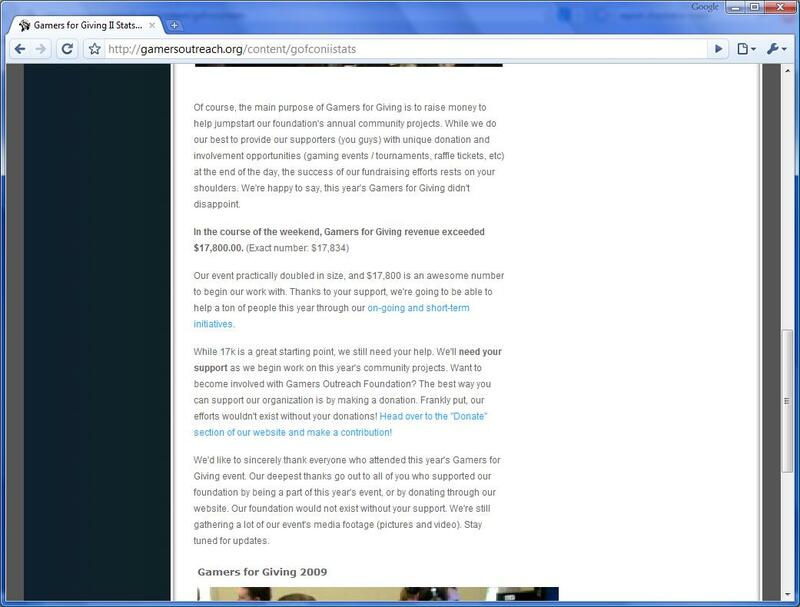 Zach's ‘charity’ manages to spend two-thirds of the money to supply one-third of the value to one-third of the people. In a strange way, that is impressive. But where does this money go? Well, according to the aforementioned 990, over $5,000 went to repay ‘loans’ from Zach and his father, Rusty, to the organization; to include a $1,200 loan made to the charity from Zach—presumably the result of rigorously saving minimum-wage paychecks for months. Nearly $3,000 went to unexplained ‘fundraising expenses’. $10,000 went to a down-payment for a website. Of course, each of these items could very well be explicable; but Rusty and Zach's silence about the financial situation speaks volumes to those willing to listen. By the time a donation was made that was actually $4,000 of the $14,000 in revenues, the folks at MPCon found themselves very confused. If they bore the brunt of the infrastructure costs, where did all of the money go? What were these mysterious costs, and why is this information not being shared? Why is a charitable organization making a $10,000 down payment on a website? Why does it cost so much to do something that MPCon has been doing for a much greater profit for years? These questions have still, to this day, never been answered, however, to help allay these concerns as well as those of general mismanagement of the organization, a member of MPCon leadership was invited onto the Gamers Outreach Foundation board. Moving forward, economic transparency was promised and cost efficiency was made a priority. At this time, the organization also obtained its 501(c)(3) status, meaning no longer would it be as outwardly apparent what percentage of the event's proceed were going to charity and what percentage were going to infrastructure. Transparency suddenly became of the utmost importance. This year, the two orgs joined forces yet again for another Gamers for Giving event, increasing the attendance draw considerably and, consequently, the income draw. The event was, by all reckonings, a complete success. Well, by all reckonings save for the financial tally; and this is where things get foggy. Zach reports a $17,834 windfall [screen cap] despite an alleged $23,000 debt. * It should be noted that, at the time this information became public (and I use the term ‘public’ in the loosest possible sense), I offered the suggestion (in an advisory capacity) to MPCon leadership that it might be time to part ways. As it turns out, my advice was largely unnecessary, as the staff had already come to much the same conclusion, and in late March, MPCon expressed its desire to part ways with GoF citing philosophical differences. So that brings us to the present. A present in which MPCon indicated its desire to distance itself from Gamers Outreach in order to operate independently. As part of the request to separate, an offer was made by MPCon; they would happily continue to donate profits from their independent events to the charity and they would be willing to run the LAN for the Gamers for Giving annual headline event at cost. The email was met with a rather ominious silence for over a month— until MPCon settled on a date for their Summer LAN, at which point the old saw about no good deed going unpunished was illustrated by the staff of Gamers Outreach. The following day, amidst much fanfare, Gamers Outreach announced their event; scheduled the weekend before MPCon's and at a $5 lower rate. Where is the money going? The events take in a rather large sum of money, and manages to spend an even larger sum. Much of it can be chalked up to mismanagement like purchasing extraordinarily depreciable items like XBox 360s and televisions or spending ten thousand dollars on a new web presence (yes, for the record, while the jury is out on the exact amount, the number $10,000 is being pretty commonly thrown around), but even gross mismanagement does not excuse losses and expenditures the likes of which they are seeing. Where is the transparency? Zach and his father (the treasurer of the organization and holder of the massive interest-free loan under which the org sits) have sworn time and again that the books are open to anyone, however I have been unable to get a copy of the financials despite having asked for them. Even interested staffers of the events in question have been unsuccessful in obtaining these financials after months of attempts. When an organization is eating massive losses and hiding the books, it does not speak well of the intentions of the management of the organization. Wait, why is the executive director's father a board member, treasurer, the only person with access to the books (apparently), and the holder of the massive loan? I would love to expand more upon this, but—well, the question really sits on its own. Explain that? The fact of the matter is, there are a number of outstanding questions floating around out there, not the least of which being what is happening with the money. When money flows in, disappears into a black box, then does or does not flow out at the whim of a 17 year old kid—well, it isn't evidence, but it is an awfully smokey gun. For my money, I will avoid spending my charitable dollars with any organization whose overhead cost is somewhere in the vicinity of 65% (or, if the debt numbers are to be believed, greater than 100%). I will even more strenuously avoid spending my charitable dollars with any organization whose overhead costs are incalculable due to the excessively private financial processes they have enacted. Look for more to come when and if they ever open up their financials so that I can verify some of these expenses; but I would not hold your breath. * The $23,000 number is as much a mystery as any other number involved. I have personally heard Zach himself utter the number (as well as others near it), however it is unclear what exactly it is that the number refers to. Transparency of finances would help here, theoretically. The saga continues, read more in part 2, in which Zach responds.